Every night after patting Lil Dumpling to sleep I stand next to the window, looking out at the night sky. Some days I see the full moon, round and bright, shining down on us with little twinkling starts against deep blue background! Some other days the same moon peeks out of dark grey clouds heavy with unshed rain. Most days I watch little drops of rain falling gently from the sky and kissing the earth, pitter pattering in a small puddle formed by one missing brick from the pathways right under the street light. On some other days, the rain is accompanied by gushing wind, howling in the dark night like a lonely wolf parted from its family and looking desperately for them. And then there are nights when torrential rain falls angrily on ground, tearing the sky like Monsoon rains in my home land! Last night I stood there, next to our bedroom window, looking out at the rain drops wrestling with wind and hitting the glass window as a demanding toddler seeking attention from his/her parents. “Look at me” it said, just like Lil Dumpling who tries to get our attention when we are getting ready to go to work in the morning, trying really hard not to be late for the early morning meeting. “Look at me. Look at me”, the torrential rain said, just like Lil Dumpling now wearing his pants on his head and socks covering his palms and dimples on his cheek! How can one miss looking at such endearing sight?! The torrential rain had all my attention, just like how Lil Dumpling gets almost all the time, as it continued to pour down, drenching the naked trees and over grown grass in our garden. The street lights shining bright on the rain drops created the illusion of double rainbows and that’s when I saw something right under the street light, floating in a puddle… A boat… Bright red boat! The paper boat race was perhaps one of the most favourite games we played in Monsoon days when heaven opens its door to the heated earth to bring down the mercury level and giving it a new lease of life! After jumping in all muddy puddles to our heart’s content and splashing water on innocent by-passers, we would wait patiently for the time to stop raining. Due to heavy Monsoon rains, every house in a street had deep and narrow gutter outside the compound wall or fence for the excess rain water to flow instead of flooding the footpath and then the main roads. The water in the gutter would rise after heavy rains and red muddy water would flow quickly, winding around the corner houses and then connect to the town’s canals and backwaters. Just when there was a sign of rain stopping to gentle drizzle, we would tear the pages from our ‘rough notes’ which was basically a thick handmade notebook made using leftover blank papers from previous year’s note books and were mainly used for practicing maths problems or writing quick notes in class rooms. The torn paper sheet would be quickly folded in the middle and then into two triangles to make the sails of our paper boats. Ready with our boats that had some mathematics formulas/equations or notes of important dates from history lessons written all over them, we would rush to the water gutter to race our paper boats. Soon the boats were dropped in fast flowing muddy water and the paper boat race was on! We ran along the muddy water in gutter that carried our paper boats shouting ‘faster and faster’ and laughing loudly when the competitor’s boats fell behind in the paper boat race. While some boats got stuck in debris of fallen leaves or stems of plants or trees, other boats sunk to the bottom of the gutter when they wound around the corner houses. After running along the boats for few meters, there would be only few boats left out of many when the race had began. And after a minute of two the competition would reach the highest point when the last two boats were left floating, half wet and almost ready to sink to the bottom of the muddy water! But soon there was just one dainty paper boat left, last one and the winning boat, floating and trying very hard not to sink with the strong current of water now almost at the point of merging with the narrow canal… At that juncture it was not just the owner of that paper boat who shrieked in delight at watching his/her boat still floating. Those who had lost their boats in the race also joined the winner and now everyone was backing the winning boat to reach the canal without sinking! The ecstatic screams and the loud cheer from us to see the last paper boat smoothly joining the canal water would wake half of the neighbourhood! We would sit there, perked on a concrete seat which was also the bridge over the narrow canal and watch till the tiny paper boat floated out of sight! Isn’t childhood is the best time in most of our life when our competitive spirit or egos didn’t crack the foundation of friendship or stop us from rejoicing from friend’s win! 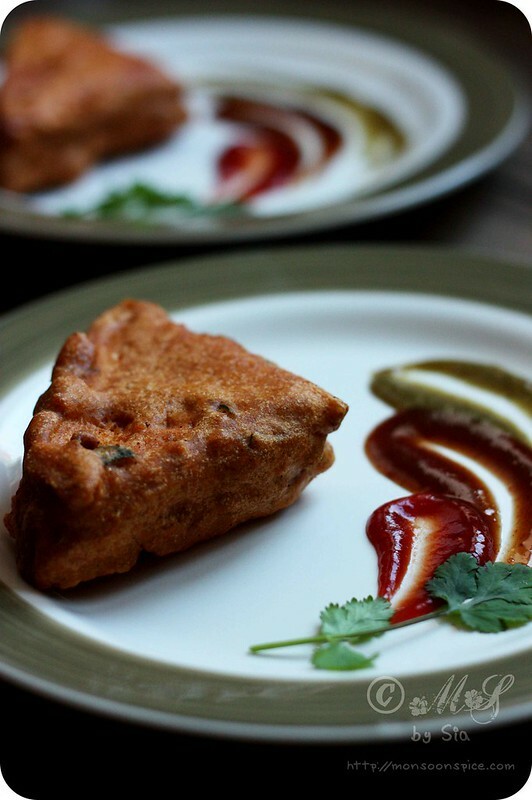 Stuffed Bread Pakoda/Pakora ~ Sinful Indulgence! So here is the recipe for one of the best snack recipes that you can indulge in whenever cravings for deep fried goodies strikes! To save some time as I was making HUGE batch of deep fried Stuffed Bread Pakodas and Aloo Bondas, I have used store bought chutneys. You can make these sweet Date and Tamarind Chutney and spicy Coriander and Mint Chutneys at home or use any other chutney or dips of your choice or can simply leave them out. 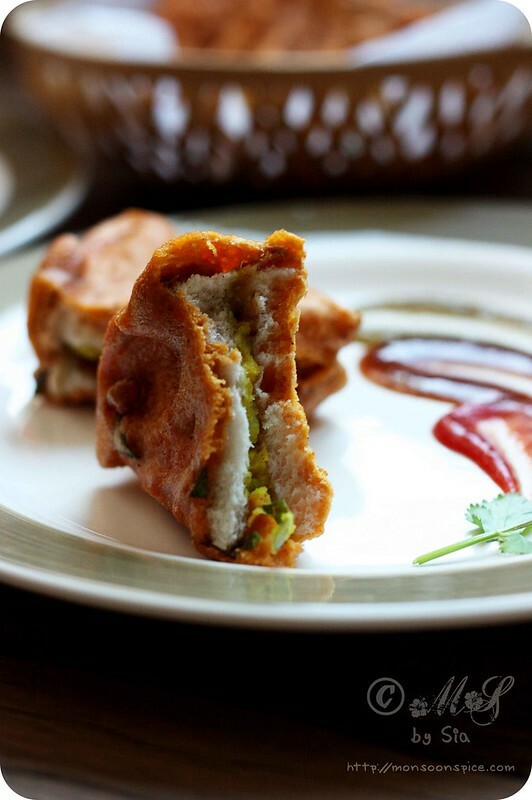 But don’t leave out the spicy mashed potato filling as it makes this Stuffed Bread Pakoda/Pakora more interesting than just dipping the bread slices in spicy chickpeas batter and deep frying. The sweet and spicy chutneys compliments the goodness of mildly spiced mashed potato filling and the gram flour coating gives it a nice crunch. 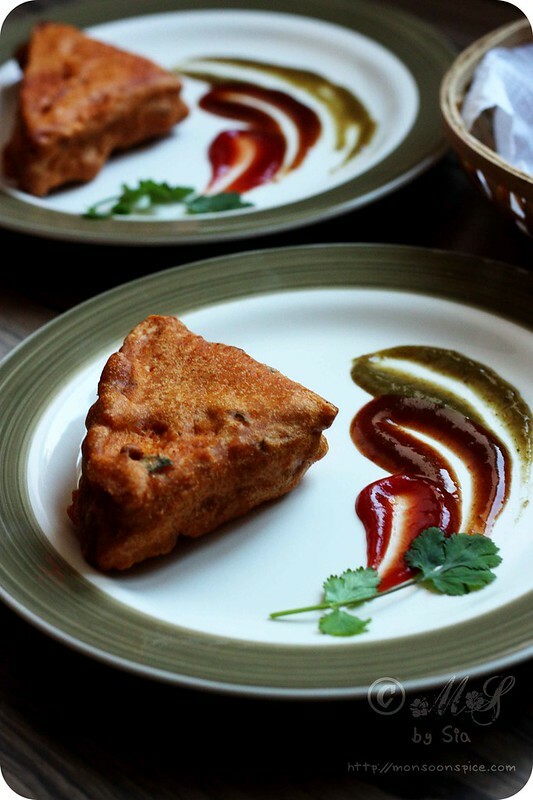 Served on its own or with assortment of chutneys, this Stuffed Bread Pakoda/Pakora makes a wonderful evening snacks with piping hot cuppa or can also be served as a delightful finger food at large gathering. 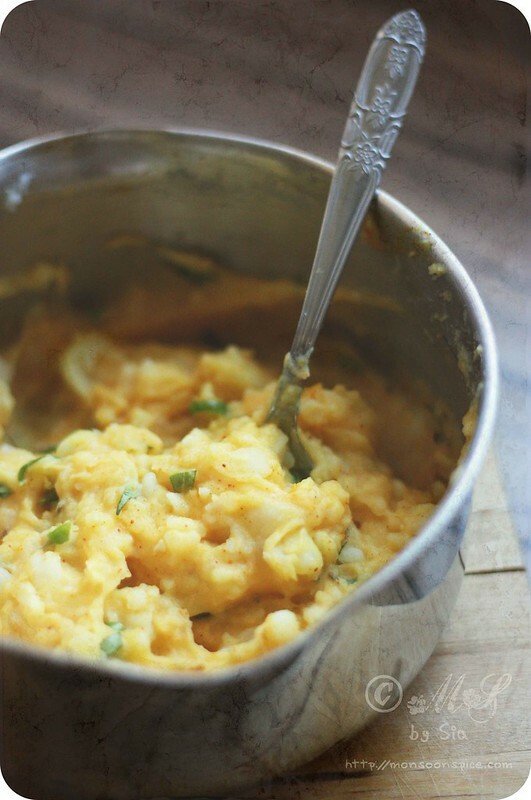 Mix all the ingredients listed under spicy potato stuffing. Adjust the salt as per taste and keep it in side until needed. If desired, you can also add 1-2 tbsp of finely chopped coriander leaves or little finely chopped curry leaves to the potato stuffing. Sift gram flour to remove the lumps and add rice flour to it. Mix them well. Add rest of the ingredients listed under gram flour batter and combine them well. 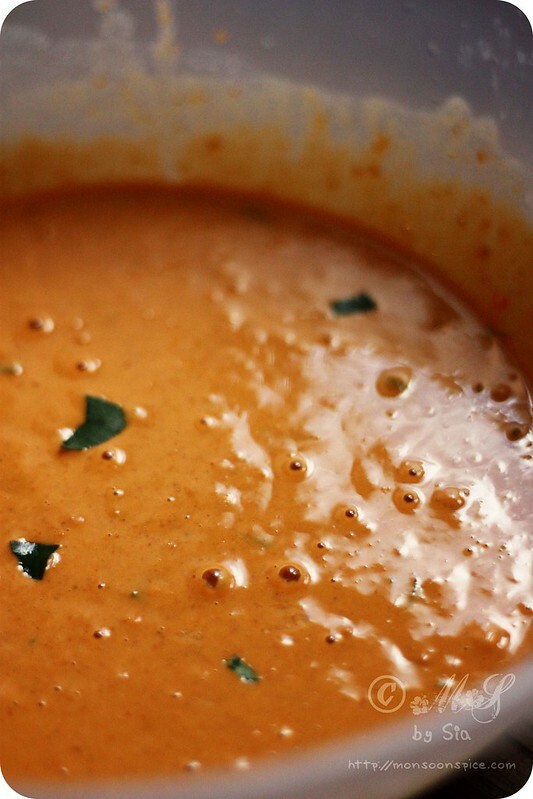 Mix in about 2 cups of water and whisk them to form a smooth, lump free batter. The batter should be bit thick but should flow easily from the whisk. Adjust the water and seasoning and keep it aside until needed. Take two slices of bread. You can trim the edges if desired. I didn’t as I am not much bothered by the crust. 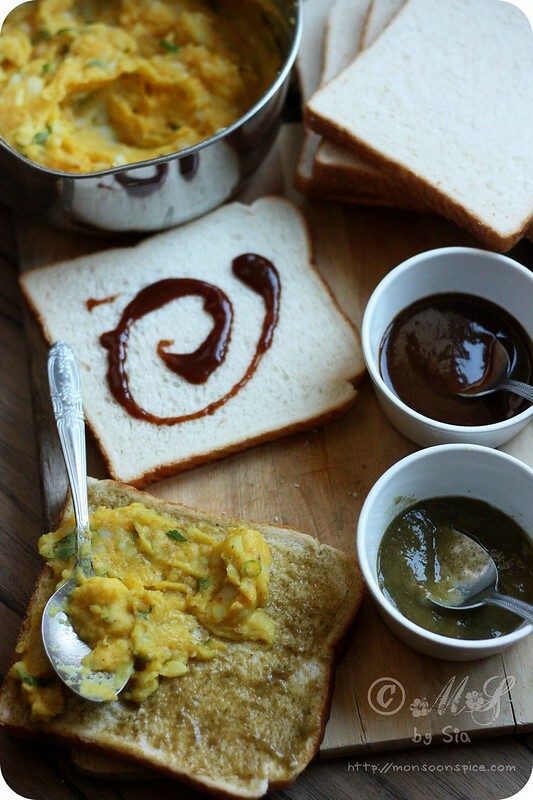 Spread about ½-¾ tablespoon of coriander and mint chutney on one slice and sweet tamarind and date chutney on the other bread slice. Next spread about 1–1½ tbsp of spicy potato stuffing on one slice of the bread and cover it with the other slice. 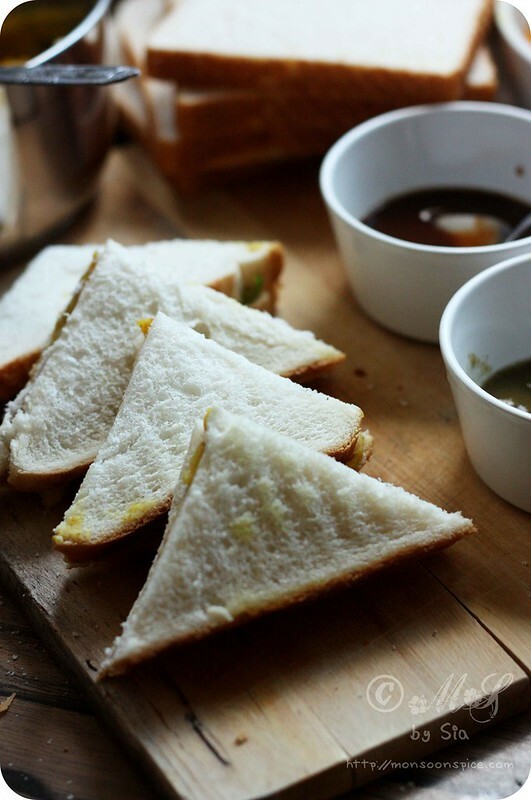 With a help of sharp knife, cut the sandwich diagonally into 2-4 triangles depending on the size of the bread slices. I used a large bread slices and hence got 4 pieces. Heat oil in a deep frying pan on medium flame. Once the oil is hot enough (test by dropping little gram flour batter in to the hot oil and if it sizzles and comes to the surface, the oil is ready for the deep frying. It will sink to the bottom of the pan if the oil is not hot enough), dip the stuffed bread sandwich in a gram flour batter. Make sure that all the sides are evenly coated with the batter and gently drop it to the hot oil. Deep fry the pakoads in batches, depending on the size of the kadai/pan used for deep frying. Mine could accommodate 3 at a time. Fry them till they turn golden brown and crisp. Each batch will take approximately 3-4 minutes. Remove the pakodas from the pan with a help of slotted spoon and place them in a plate/bowl lined with kitchen towel. 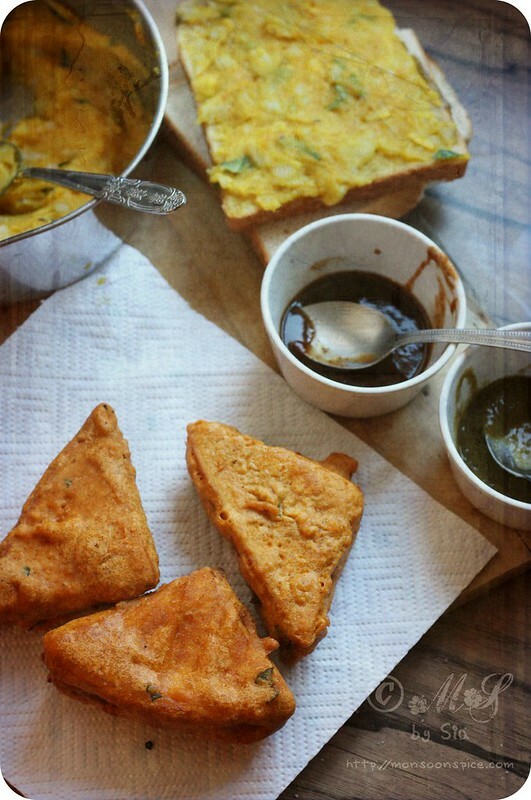 Repeat and deep fry rest of the Bread Pakoda/Pakoras. 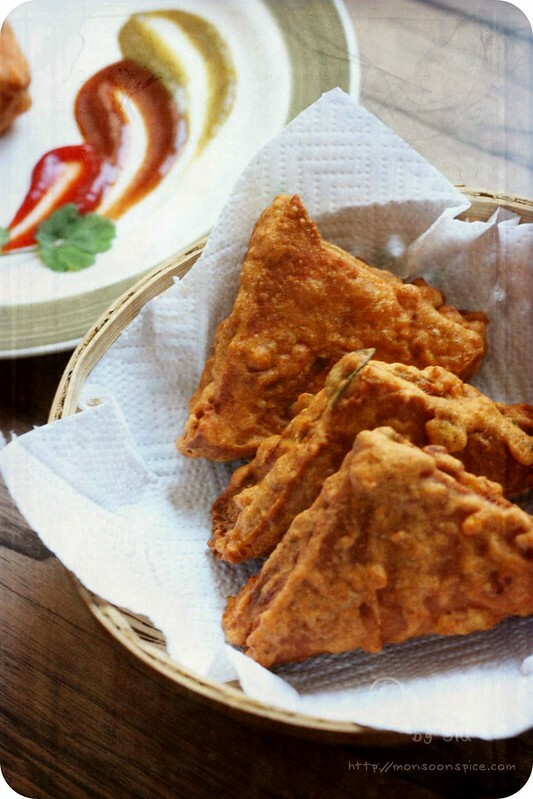 Serve this delicious, hot and crisp Stuffed Bread Pakoda/Pakora hot with any chutney or dipping sauce of your choice. 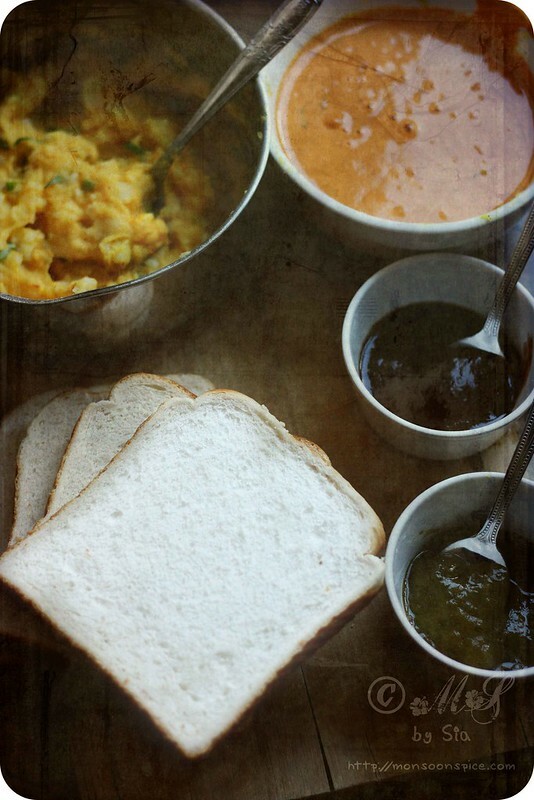 I personally like to serve it with tomato ketchup or green chutney or sweet tamarind and date chutney. It tastes good on its own too! I have used store bought spicy coriander-mint chutney and sweet date-tamarind chutney. 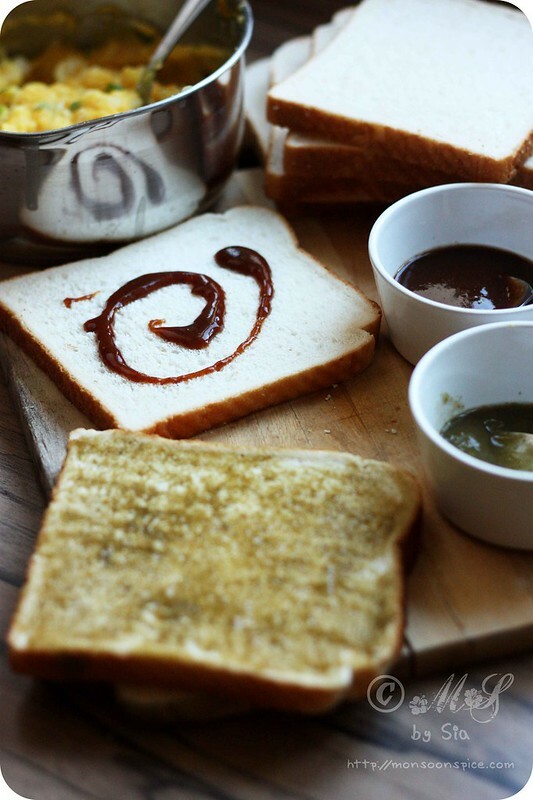 You can make it fresh at home by following the recipe here or you can replace them with any chutney or sauce of your choice as a spread. Although it tastes best when served fresh, you can refrigerate for 2 days in air tight container. When needed, place them in a baking tray and pop them in an oven heated at 180 deg C for 10-12 minutes, turning once after 6 minutes to crisp both sides. I love the idea! That is a wonderful speciality. perfect with pickles or chutney. Coming to the todays recipe it is one of my personal favourite. I never had bread pakoda stuffed only had plain one. this version looks mouth watering ! Bookmarked ! Beutiful Pics Sia, as always. My hubby loves bread pakora. lovely and yummy dish, my favorite too. its perfect snack any time of the day. What a beautiful post it is. It took me down the memory lane that was forgotten. 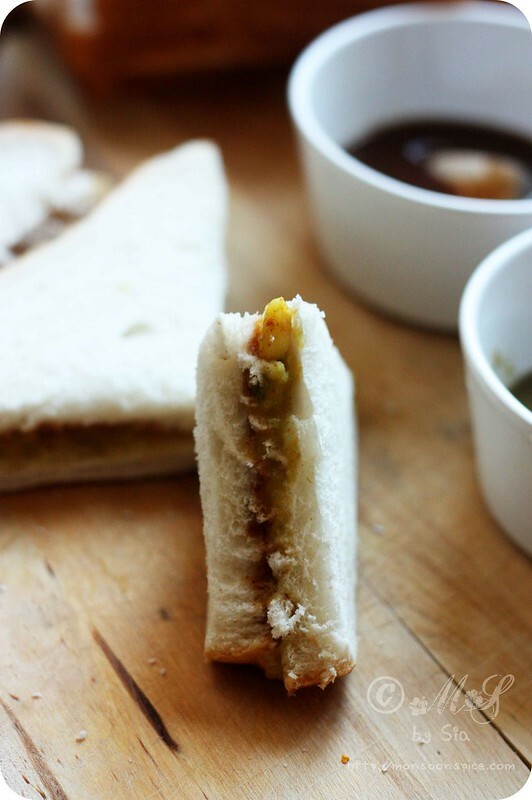 I love smearing green chutney and tamarind chutney in my sandwich. This will be my favorite recipe. the sauces on the plate look very pretty. i have made the regular kind only, must try the stuffed ones once i guess. Oh you brought back so many drizzly, paperboat memories, Sia :) I still make them for Chotto-Ma every now and then - and there are always enough puddles here to float them in! 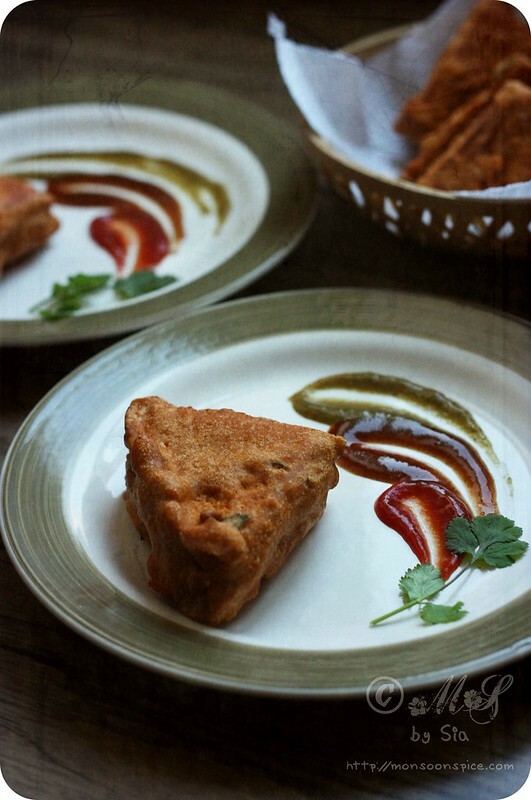 The bread pakora looks perfect. I'm tucking it away for the next rainy day. Which shouldn't be long. Mouth watering recipe Sia. Love the plating!! @Pinky, it always makes me happy to see people who come here to read my ramblings/rants and not just for recipes :) thank you Pinky for making my day! @Kadhyaa, thank u for your kind words :) and oh, do try this stuffed version as it tastes absolutely delicious! I usually make them whenever we have masala dosa as the potato masala makes a perfect filling for this pakoda. Hi, amazing recipe, thanks for sharing with us! 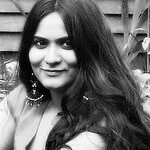 loved reading ur blog here....and as i was reading, memories of rainy summer evenings flashed through...i couldn't help but smile... and ah! 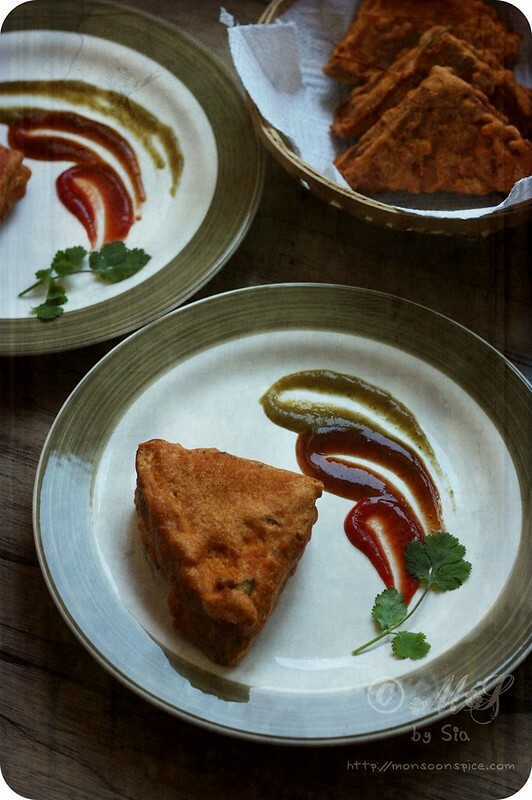 bread pakoras ...a sure shot way to celebrate cool rainy evenings....on my list for sure! !just waiting for the drizzle...haha!